How fun! I get to review my pal Bailey’s book on his birthday! Happy birthday, Bailey! If you don’t know Bailey, you should visit his blog. He’s a very special kitty — he lives on a boat! In fact he may be the only blogging boat cat around. At least he is the only one I know personally! It is because of his unique living situation that he got a book deal. The publishers thought humans and other kitties would want to know what life was like for a boat cat. 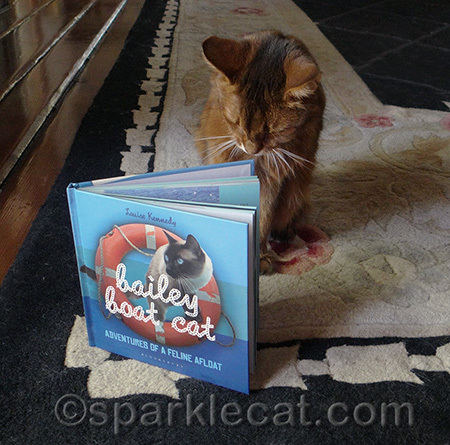 And Bailey obliged with a charming little book full of photos and nautical wisdom (from a cat’s point of view, of course!). Let’s take a quick look inside! 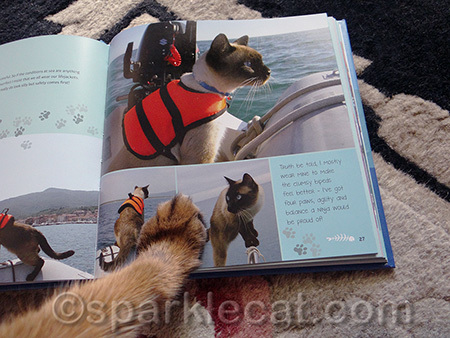 Bailey Boat Cat: Adventures of a Feline Afloat is a little under 100 pages and full color throughout, which is awesome because the photos are beautiful! It’s also laid out very charmingly in ocean colors. Bailey and his humans live full time on their boat, the Nocturne, and hope to sail around the world one day in the not too distant future. So as you can imagine, Bailey knows a lot about both boat and human upkeep! But he makes things like boat knots, cloud calculations and “trimming the sails” very easy to understand. If you are a kitty, you also get tips on “how to communicate with your tongue,” the top five things to remember in an emergency (my favorite was number 4: “Take the opportunity to scratch all the furniture. You might not get the pleasure again.”), and of course, you get to hear all about the dinghy devils, better known to feline landlubbers as seagulls. Binga enjoyed Bailey Boat Cat too — I think it made her dream of fish. This is a very fun book, and you will come away knowing more about boating and human management than when you started! 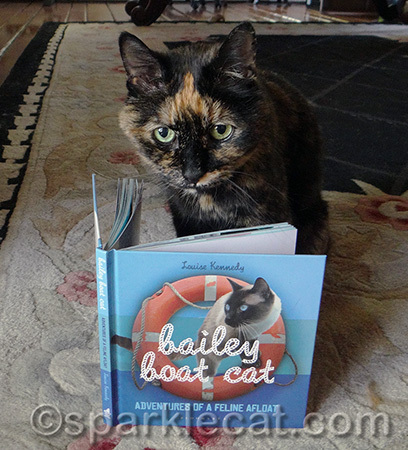 It’s a great gift book for boat lovers and cat lovers, and children will especially enjoy it! Even if you are like my human and know very little about boats, you will love reading about Bailey’s day to day life and may be tempted to set sail! 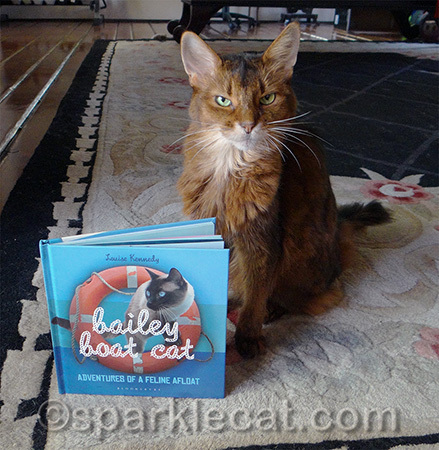 Bailey Boat Cat is available at Amazon in both hardcover and Kindle — buy it here! Link to Amazon is an affiliate link, which means I get a small commission when you buy the book by clicking on it. But don’t you think I earned it? Did ya nose dat Bailey iz me honoraree Brofur as we iz both adopted by Kittehz Blue?!?!?! He iz an amazin kitteh n me adorez him alot..
We haz a copy of hiz book n we lubz to reed it over n over…. Bailey is one cool cat! That’s so very cool! We are going to have to check that book out! we think Bailey is very brave to live on a boat 🙂 this book looks like a lot of fun. Thanks for sharing about it, Sparkle. We’ll definitely have to add this to our library. Great review!! We need to have Mom check it out. Happy Birthday Bailey! That review makes me want to read it and look at the handsome pictures. What an interesting book. We will have to go check Bailey’s blog out. I hope your buddy has a great birthday! That’s cool!!! And he is Siamese!!!! !